NASA unveiled a spectacular high-resolution mosaic of Saturn's enigmatic moon Phoebe today, along with other data from the Saturn-bound Cassini probe showing the moon formed in the extreme outer solar system and later was captured by the ringed planet's gravity. "The data that we gathered with the Cassini spacecraft have now given us our first look at this very strange object," said Torrence Johnson, a senior scientist and Cassini team member at the Jet Propulsion Laboratory in Pasadena, Calif. "And what it's told us is that it's a collection of ice and rock and probably carbonaceous compounds. "We believe this object has many characteristics in common with things like Pluto and (Neptune's moon) Triton in the outer solar system. In other words, it's a first look at one of these denizens of the outer solar system that we've (seen previously) only from afar." The $3.3 billion Cassini probe, launched in 1997, is scheduled to brake into orbit around Saturn the night of June 30. On June 11, it made a close flyby of Phoebe, giving scientists their first close-up look at the strange moon since Voyager 2 captured a few grainy images in 1981. Voyager 2 imaged Phoebe from a distance of 1.4 million miles. Cassini passed within about 1,285 miles. "The Phoebe encounter was a tremendous success scientifically, but also all the instruments worked great, the spacecraft performed beautifully, the nav team put us in exactly the right place and we have wonderful data from all of the experiments," Johnson said. "It's a great warm up for Saturn." Discovered in 1898, Phoebe measures just 137 miles or so across, orbits Saturn at a distance of about nine million miles and circles the planet in the opposite direction from its other moons. Because of that, and the tilt of its orbit, scientists long suspected Phoebe was a captured asteroid or an outer solar system Kuiper belt object left over from the birth of the solar system. The Cassini data indicate the moon almost certainly did, in fact, originate in the Kuiper belt in the extreme outer solar system. Roger Clark, a Cassini researcher with the U.S. Geological Survey said in a new release that "all our evidence leads us to conclude Phoebe's surface is made of water ice, water-bearing minerals, carbon dioxide, possible clays and primitive organic chemicals in patches at different locations on the surface." Cassini also detected as-yet-unknown compounds. But the presence of carbon dioxide provides clear evidence of Phoebe's origin. 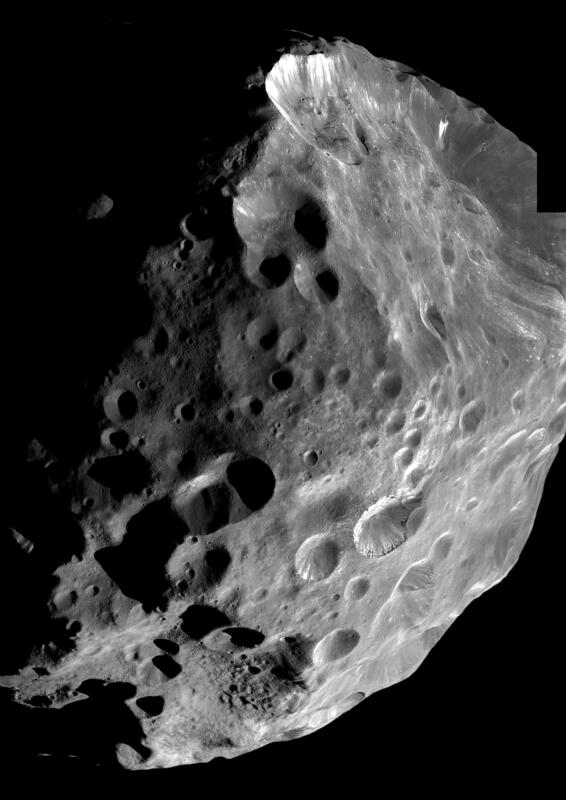 "Phoebe is definitely not an asteroid," said Bonnie Buratti, a member of the Cassini visual and infrared mapping spectrometer team. "It did not form in the asteroid belt because you don't see CO2 in the asteroid belt. "It formed some place in the outer solar system beyond the orbit of Jupiter. We believe this is evidence that it came from the Kuiper belt and that it was dragged into the Saturnian system early in the formation of the solar system. So what we see is a very diverse body." With a density of 1.6 grams per cubic centimeter, Phoebe is heavier than pure ice but lighter than most rocks. Johnson said the ratio of water ice to rocky material is similar to that of Pluto and Triton. "We believe that four-and-a-half billion years ago, when the solar system was forming, that there were a lot of bodies like Phoebe in the outer solar system," Johnson said. "Since then, most of those bodies have either been accreted in the planets, they have become part of Jupiter, Saturn, Uranus and Neptune, or been gravitationally flung out of the system, out into the outer solar system. Apparently, Phoebe managed to hang around to be captured around Saturn." Cassini project scientist Dennis Matson said Cassini had provided more data about Phoebe in two weeks than scientists on the ground had been able to collect over the past century.